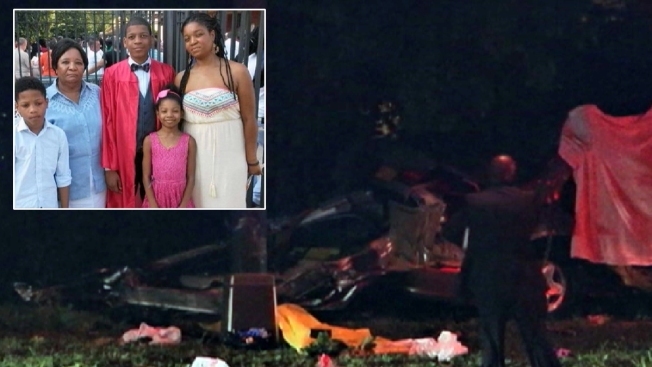 A woman, her three children and their grandmother were returning home from a family gathering when their car veered off a Long Island highway, crashed into a tree and burst into flames, killing all of them, authorities said Sunday. Myriam Lebrun, 37, was traveling on the Southern State Parkway toward Brooklyn just before 11 p.m. Saturday when her Honda Accord left the westbound lanes near Exit 38 in Babylon and smashed into the tree, state police said. All five family members in the car died. State police identified the other victims as 68-year-old Moise Yolande, 14-year-old Marcus Jeanty, 9-year-old Marcel Jeanty and 8-year-old Kayla Jeanty. It was unclear why the car veered off the road. "It looks like a combination of speed and we're investigating the possibility of alcohol," lead state police investigator Charles Knapp said. Emergency responders and witnesses described heavy fire, with flames shooting into the sky. "The front of the car was pretty much engulfed in flames," Robert Cabano, North Babylon first assistant fire chief, told Newsday. He said one passenger was found outside the car. Thomas Bennett said he stopped his car and ran to the crashed vehicle to help, but flames rapidly consumed the car. "When I arrived it was just the front. And it got big, like every minute it was just growing and the whole car was just up in flames," Bennett said. On a quiet, tree-lined street in Brooklyn, a gentle breeze kept swinging open the front screen door of the family's semi-attached, two-story brick house in the Flatlands neighborhood. A hula hoop leaned against a porch wall. “I don't know how we're going to get through it," said Mayerline Moise, one of Lebrun's cousins. Relatives said they were trying to focus on the positive, such as the love Lebrun had for her family. "She wouldn't want us to cry,” said Moise. “She would've wanted us to turn on some Haitian music and dance. That's how she was." A neighbor, Sarah Hogart, stood in front of her door, looking across the low, brick partition they shared. "I just found out what happened; I'm so shocked," Hogart said. She said the Haitian family had lived there for all three years since she herself moved into the working-class neighborhood of families, mostly of Caribbean origin. The mother and grandmother "were very attentive to the kids, who were always playing outside, they were the life of the block, running up and down," said Hogart, adding that Kayla was especially "bubbly, always laughing." Susana Moncoyo, a native of Peru who lives in an apartment under the family's house, said she saw the children playing in front of her door every day. "Their mother was a very happy woman, always smiling," she said. Moncoyo said the children's father did not live with them. The crash shut down part of the Southern State Parkway for several hours. The westbound lanes of the highway, which were closed after the crash, reopened just after 3:30 a.m., the police said. The family has set up a crowdfunding site to help pay for funeral expenses that can be found here.